Where did I get it? I bought it after reading good reviews. What's it about? Set in the 1930s, Daisy and Hazel are detectives and have at this point solved two mysteries (hence the subtitle "A murder most unladylike mystery"), one of which took place at Daisy's home. 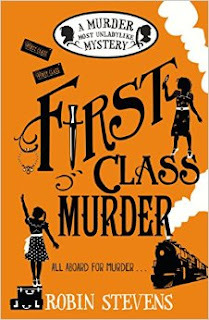 In this book, Hazel's father takes Hazel and Daisy on the Orient Express, where one of their fellow passengers is murdered. Daisy and Hazel must battle Hazel's father, who wants them to behave, as well as other detectives, to unravel the mystery of the locked sleeping compartment where the passenger died. Six suspects each have a reason for wanting her dead - so who did it? What age range is it for? 9+, it's very gentle and suitable for fans of the Famous Five and so on. If I was ten years old I would be ALL OVER this series! Are any main characters non-white? Yes - Hazel is from Hong Kong and there's quite a few references to the racism she encounters and how England is very strange to her. It's very nicely done. Is there any talk of death? Yes, as a murder has occurred. However, it's not done in a gory fashion at all. Are there swear words? Not at all. Would I recommend the book? Yes, absolutely. Daisy and Hazel are both likable characters and there's a lovely slowness to the prose which would be perfect for an older child. How many stars? 8 out of 10. It's definitely a good middle grade novel and I'll look out for the others in the series. Where is the book going now? I'll probably keep it, I like the cover a lot!